Its hot, the girls are at their peak, and life is good. There's still some flora, and hot shot drones fill the DCAs in the event of a queen event. Varroa has not yet turned the tables fully on the declining hive population, and all seems well with the world. We may be inclined to let it all just continue on auto-pilot. However, be aware that we are right where our bee year is about to start: Fall.... SO, what are we looking for this month? Lots!!! 1-Queenright-Is she laying well, solid pattern, or spotty? Even when brooding down, laying pattern can tell you a lot. (Careful though; hygienic behavior can look at times like a queen running out of steam). We want a strong queen to go through winter, and there is still time to requeen if needed. 2-Supers- Most of the flora is starting to dwindle, (rabbit brush and sage and some ivy's still to ripen though in the rural areas) so removing honey supers when capped helps keep robbing down and gives the hive a chance to pack their own stores away before winter. That 2nd hive body (on a Langstroth) should be full of their own honey for their own use. Generally about 80 pounds of honey is needed for our C.O. 3-Feeding- After removing the super, and as the browse dries up, (dearth) monitor honey stores. Feed 2:1, or any measure close to that. Exact measure is not an issue. Natural flower nectar comes in various concentrations, so don't get an ulcer about being exact...just feed them if the hive needs honey. (I throw on a protein patty for good measure as brood is still being produced). Feed inside the hive as opposed to front feeders to avoid robbing. If you use any scented food (essential oils) its good to feed all the hives in the Apiary, not just the weak ones, as the big guys will take the smaller hives out and it can get ugly. Restrict entrances on weaker hives to make them easier to defend. (All of this is usually around mid-August, but just keep an eye on your colony's stores. One advantage to fall feeding is that this food is placed in the cells where brood has just emerged. This then helps to compact the brood area, placing stores exactly where it is best accessed: above and to the sides of the brood chamber. 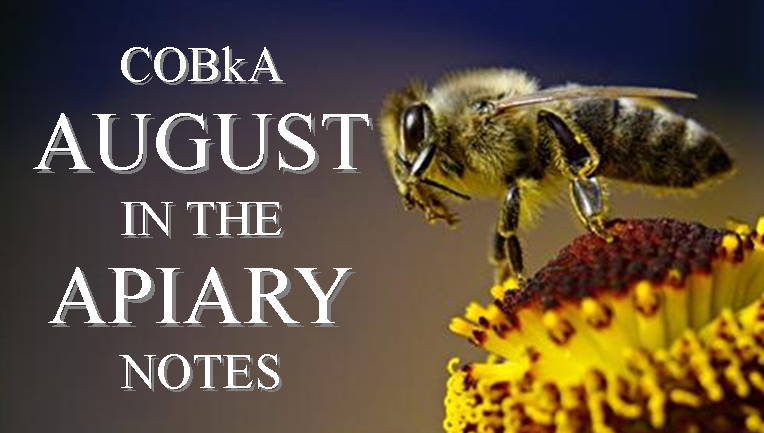 4-Mites- August, September...these are when your winter bees will be started. Take a count, and be proactive. I like to have my counts down to 1 or 2 per 300 bees, treating by August first (but thats me). The goal is strong, uncompromised winter bees. Wait too long, and you miss the window to stop a crash (if your mite load is 3% or more). Need help getting a count? Call a beekeeper or read on how to do a sugar roll. There is support out there for you! 5-Colony Balance- good time to adjust for food stores, adult population, brood population, between your apiary hives. Bolster weaker ones, (or if really weak, combine them if healthy). Compacting the brood to the bottom box is good, especially if you are needing to feed. Note: work bees in the cool hours of the day, not when the heat, the suit and excessive sweating can make you ill. When I must work in full heat, more than 30 minutes, I have learned to dampen or wet my hood and jacket. It makes a WORLD of difference.